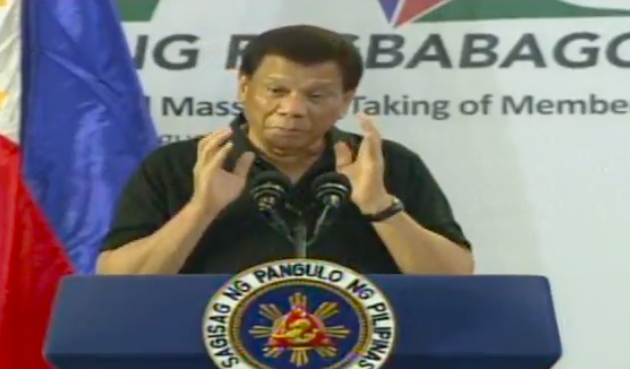 The president speaking in Davao today when he made his remarks about so-called ninja cops. President Duterte has offered a five million peso bounty for dead cops involved in the drug trade — but only 10,000 if they are taken alive. Speaking at the convention of his daughter’s new political party Hugpong Pagbabago in Davao today (Friday, August 17) he said: “If you bring him to me dead, I’ll give you five million pesos. If alive, I’ll give you 10,000.” His words were met by laughter and applause. The president has previously announced bounties for corrupt cops, raising the reward money from two to three million pesos. In his speech today, he urged erring police officers to turn themselves in to the authorities “within 48 hours” or else, he said, he would continue to raise the bounty. Earlier today, police spokesman Senior Superintendent Benigno Durana said the Philippine National Police (PNP) would not spare ninja cops from its “relentless and chilling” war on illegal drugs. Sr. Supt. Durana said the PNP would be “aggressive” in cleansing its ranks of any corrupt police officers. “While we can be relentless in our campaign against drug users and drug pushers at the street level, we also would want to be relentless and chilling in our desire to rid our ranks of misfits and scallawags, especially those who are involved in illegal drug operation or those who are using illegal drugs,” he said. When will he arrest his son for extensive involvement in the drug trade?